 Eastern Red Cedar (Juniperus virginiana) - similar only in name, different appearance. Habitat: Fields and Open Areas, Wet Areas; Just about anywhere: mainly on rocky areas, and wet areas. Notes: Eastern White Cedar, commonly called just plain "Cedar", grows in a variety of locations that we humans might call "stressful". It loves to grow up from cracks in rocks, on alvar pavements, and in swamps. Photographs: 260 photographs available, of which 11 are featured on this page. SCROLL DOWN FOR PHOTOGRAPHS. 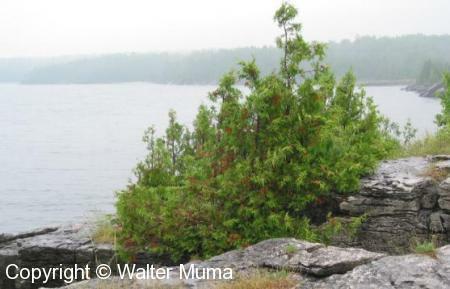 Here is a clump of small Eastern White Cedar growing in a rock crack at the western end of Manitoulin Island (Ontario). 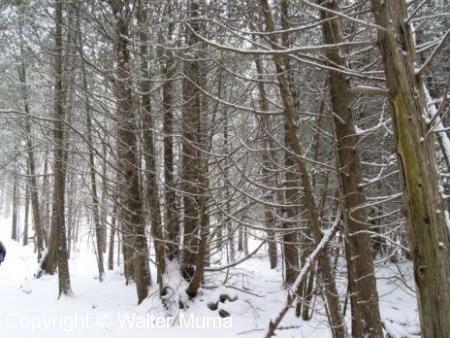 In a forest, the lower branches of Eastern White Cedar die off. They make excellent campfire wood. 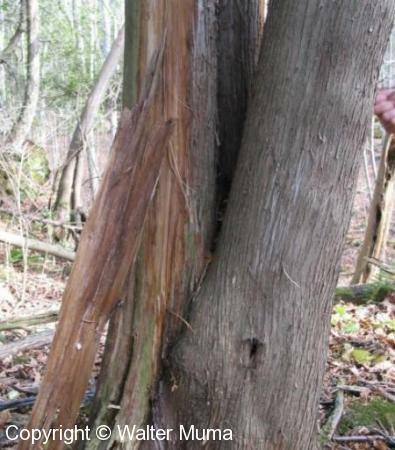 The bark is stringy and flakey, and peels readily. It is soft, and can be made into a variety of useful items in a wilderness living or primitive survival situation. West coast natives even made clothing from the western counterparts of this stree. They sometimes grow in clumps, as shown here. Typical Eastern White Cedar leaves or needles. 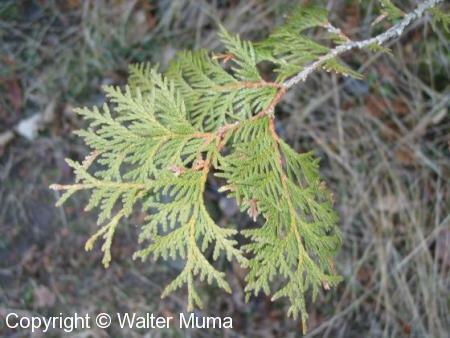 Eastern White Cedar is an evergreen. Eastern White Cedar cones, opened. Another view of the leaves and cones, in winter. 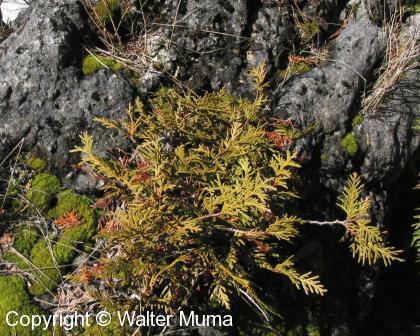 A young Eastern White Cedar, growing on a limestone rock. 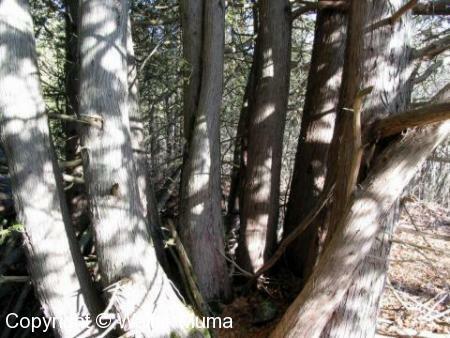 Here's a photo showing the typical Eastern White Cedar shape and form. A beautiful tree!